Sr. Chief Master Sgt. Roosevelt Jones,Charles Rader, Brig. Gen. Ernest “Dragon” Teichert. On a mission in December1944, Charles “Charlie” Rader, was top turret gunner, one of a 10-man crew on a B-17 heavy bomber from the “Rum Hounds” Squadron, flying out of Foggia, Italy, with the 15th Air Force. The partisans were fighting the Nazis too. 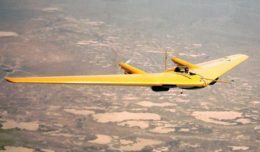 In other words they were “friendlies” and had a field hospital near that “boulder strewn field” where the crew crash-landed after leaking fuel and losing three out of four engines. The B-17 Flying Fortress could take a licking and keep on ticking. All crew, even the badly wounded nose gunner survived, and were exfiltrated by a Royal Navy ship. Marine Jerry Lawrence, Bob Alvis, USAF, MCL 930 Commandant Chris Chandler. — with Jerry Lawrence, Bob Alvis and Chris Chandler. Cut forward three quarters of a century. On Feb. 2, 2019, Brig. 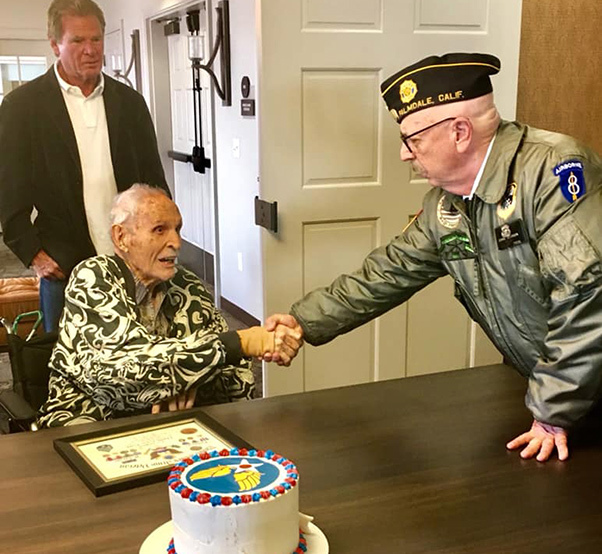 Gen. Ernest “Dragon” Teichert, commander of the 412th Test Wing at Edwards Ari Force Base, Calif., arrived at a Lancaster skilled nursing facility, to recognize Rader’s service. 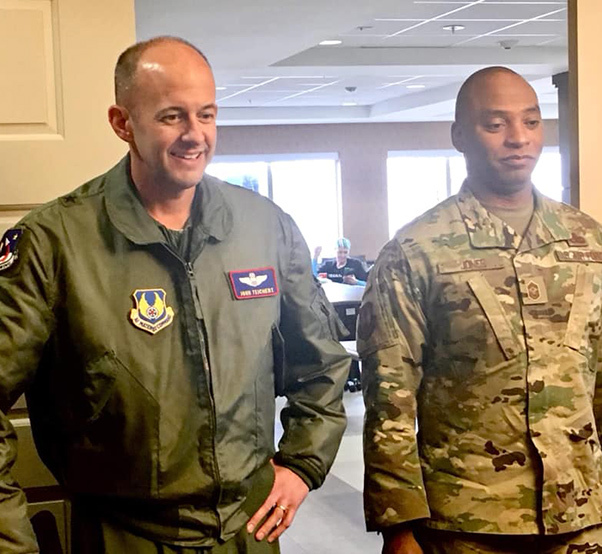 He was joined by Command Chief Master Sgt. Roosevelt Jones. 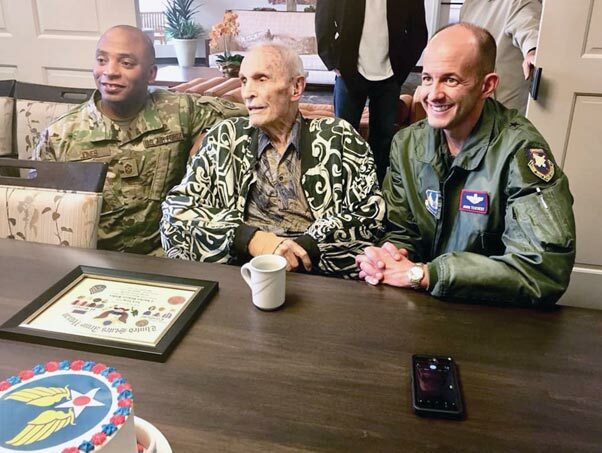 “It’s an honor to meet you, and you are what the Air Force is all about,” Teichert told Rader. “Well, I’m glad I was here to enjoy this,” Rader said. Rader was joined by his son, David, and about a dozen family friends and veterans. 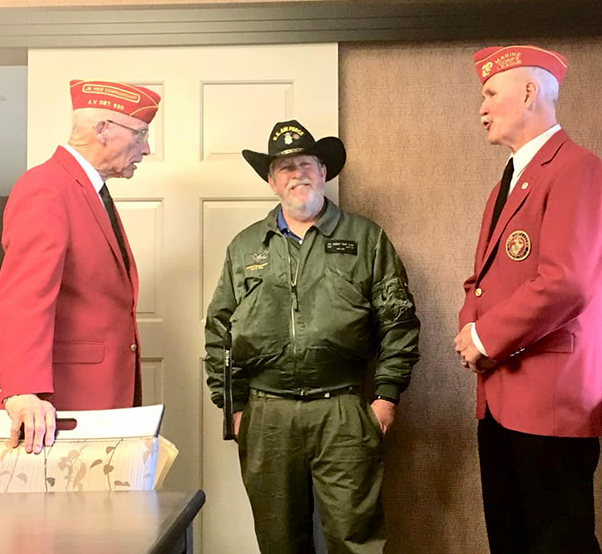 Rader was recognized as part of a volunteer project — “You Are Not Forgotten” — initiated by Marine Corps veteran Jerry Lawrence. The Certificate of Recognition was produced by Lawrence and his associate, John Wallasky, a hospice chaplain. An Army Air Corps cake was baked and decorated by Adriana Hancock, wife of wounded warrior and Iraq War veteran Jerral Hancock. Attending in support included Air Force Sgt. Bob Alvis, U.S. Air Force recruiter Staff Sgt. Steven D. Whalen, Chris Chandler, commandant Detachment 930, Marine Corps League, veterans Lawrence and Dennis Anderson, Army sergeant during the Cold War, and Iraq War Embed with California National Guard Unit first into Iraq, 1498th T.C. Rader, Alvis notes, is one of the 722 “Boulevard Boys,” The Greatest Generation veterans who went out to help win World War II. 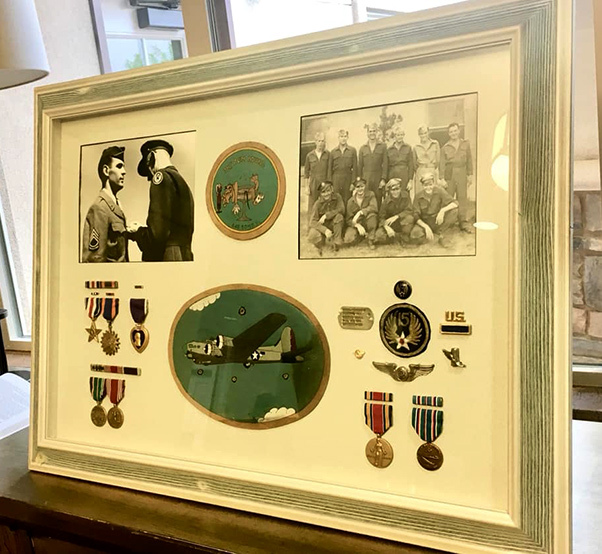 Their exploits are recounted in fine history book, written, edited and compiled by Antelope Valley historian Dayle DeBry — General Manager Lancaster Cemetery.